Franklinia is a monotypic genus in the tea plant family, Theaceae. 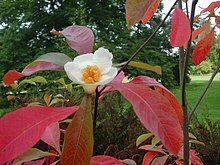 The sole species in this genus is a flowering tree, Franklinia alatamaha, commonly called the Franklin tree, and native to the Altamaha River valley in Georgia in the southeastern United States. It has been extinct in the wild since the early 19th century, but survives as a cultivated ornamental tree. Franklinia is now thought to be closer in relation to the Asian genus Schima. Recent DNA studies and examinations of floral ontogeny in the Theaceae place Franklinia together with Gordonia and Schima in a subtribe. Hybrid crosses have been produced between Franklinia alatamaha and Gordonia lasianthus, and between Franklinia alatamaha and Schima argentea. Franklinia alatamaha is a deciduous large shrub or small tree growing to 10 m (33 ft) tall, but commonly 4.5–7.5 m (15–25 ft). It is commercially available for garden cultivation. It is prized for its lightly fragrant white flowers, similar to single white Camellia blossoms; the smell may remind some of orange blossoms or honeysuckle. The tree has a symmetrical, somewhat pyramidal shape, often with different individuals of the species forming almost identical crowns. It frequently suckers and can form several vertical trunks close to ground level. The bark is gray with vertical white striations and has a ridged texture. The alternate, obovate leaves are up to 6 in (15 cm) in length and turn a bright orange-red in the fall. Although difficult to transplant, once established, F. alatamaha can live a century or more. Franklinia alatamaha fruit develop slowly. The seed capsules require 12–14 months to mature. When ripe the pentavalved spherical capsules split above and below in a unique manner. Anecdotal evidence suggests viable seed production is enhanced where two or more plants are present in close proximity. Philadelphia botanists John and William Bartram first observed the tree growing along the Altamaha River near Fort Barrington in the British colony of Georgia in October 1765. John Bartram recorded "severall very curious shrubs" in his journal entry for October 1, 1765. William Bartram returned several times to the same location on the Altamaha during a collecting trip to the American South, funded by Dr. John Fothergill of London. William Bartram collected F. alatamaha seeds during this extended trip to the South from 1773 through 1776, a journey described in his book Bartram's Travels published in Philadelphia in 1791. William Bartram brought seed back to Philadelphia in 1777 at which time William reported to his father that he had relocated the plant, but this time had been able to retrieve its seeds although it was not until after John's death (1777) that he was able to achieve flowering plants (1781). After several years of study, William Bartram assigned the “rare and elegant flowering shrub” to a new genus Franklinia, named in honor of his father's great friend Benjamin Franklin. The new plant name, Franklinia alatamaha, was first published by a Bartram cousin, Humphry Marshall, in 1785 in his catalogue of North American trees and shrubs entitled Arbustrum Americanum. (Marshall 1785: 48-50; Fry 2001). William Bartram was the first to report the extremely limited distribution of Franklinia. "We never saw it grow in any other place, nor have I ever since seen it growing wild, in all my travels, from Pennsylvania to Point Coupe, on the banks of the Mississippi, which must be allowed a very singular and unaccountable circumstance; at this place there are two or 3 acres (12,000 m2) of ground where it grows plentifully." (W. Bartram 1791: 468). The tree was last verified in the wild in 1803 by the English plant collector John Lyon, (although there are hints it may have been present into at least the 1840s.). The cause of its extinction in the wild is not known, but has been attributed to a number of causes including fire, flood, overcollection by plant collectors, and fungal disease introduced with the cultivation of cotton plants. All the Franklin trees known to exist today are descended from seed collected by William Bartram and propagated at Bartram's Garden in Philadelphia. It has now been cultivated in excess of 1000 sites worldwide. The Franklin tree has a reputation among gardeners for being difficult to cultivate, especially in urban environments. It prefers sandy, high-acid soil, and does not tolerate compacted clay soil, excessive moisture, or any disturbance to its roots. The Franklin tree has no known pests, but it is subject to a root-rot disease and does not endure drought well. Wikimedia Commons has media related to Franklinia alatamaha. ^ Rivers, M.C. (2015). "Franklinia alatamaha". The IUCN Red List of Threatened Species. IUCN. 2015: e.T30408A62077322. doi:10.2305/IUCN.UK.2015-2.RLTS.T30408A62077322.en. Retrieved 5 December 2017. ^ a b c Franklinia alatamaha was originally described and published in Arbustrum Americanum: The American Grove, or, an Alphabetical Catalogue of Forest Trees and Shrubs, Natives of the American United States, Arranged according to the Linnaean System. Philadelphia. 49 (-50). 1785. "Franklinia alatamaha". Germplasm Resources Information Network (GRIN). Agricultural Research Service (ARS), United States Department of Agriculture (USDA). Retrieved November 20, 2012. ^ Tsou, Chih-Hua. 1998. "Early Floral Development of Camellioideae (Theaceae)," American Journal of Botany, 85(11), p. 1531-1547. ^ Orton, Elwin R., Jr. 1977. "Successful Hybridization of Gordonia lasianthus (L.) Ellis x Franklinia alatamaha Marshall," American Association of Botanical Gardens and Arboreta, vol. 11, no. 4 (October), p. 81-84. ^ Ranney, Thomas G. and Thomas A. Eaker, Paul R. Frantz, Clifford R. Parks. 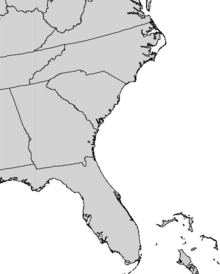 2003 "xSchimlinia floridbunda (Theaceae): A New Intergeneric Hybrid between Franklinia alatamaha and Schima argentea," HortScience, vol. 38(6), October, p. 1198-1200. ^ Bozeman, John R. and George A. Rogers. 1986. “‘This very curious tree’: Despite years of searching and research the enigma of Franklinia alatamaha endures,” Tipularia, (November), p. 9-15. ^ Dirr, Michael A. 1998. Manual of Woody Landscape Plants: Their Identification, Ornamental Characteristics, Culture, Propagation and Uses. Stipes Publishing L.L.C. : Champaign, IL. ^ Bartram's Garden (Philadelphia, Pa., USA), "The Franklinia Story," http://www.bartramsgarden.org/franklinia/index.html, accessed 1 July 2007. ^ U.S. Forest Service, "Franklinia Alatamaha, Franklin-Tree," Fact Sheet ST-260, November 1993. Bartram, William. 1791. Travels Through North & South Carolina, Georgia, East & West Florida,…. James & Johnson: Philadelphia. Fry, Joel T. 2000. “Franklinia alatamaha, A History of that ‘Very Curious’ Shrub, Part 1: Discovery and Naming of the Franklinia”, Bartram Broadside, (Spring), p. 1-24. Marshall, Humphry. 1785. Arbustrum Americanum. The American Grove, or an Alphabetical Catalogue of Forest Trees and Shrubs, Natives of the American United States, Arranged According to the Linnaean System…, Joseph Cruikshank: Philadelphia. Del Tredici, Peter. "Against All Odds: Growing Franklinia in Boston." Arnoldia 63 (4) (2005). This page was last edited on 12 December 2018, at 06:17 (UTC).